Emily Wants to Play Too Review – Delivery Successful? Earliest I can remember personally seeing horror elements in a video game was the original F.E.A.R. The terrifying context of a little girl following you around everywhere you go hiding in the shadows and giggling every time you walk past left you on edge. Since then, the horror genre has become widely popular, and new developers have found new ways of making players tremble in terror. The idea of playing a character who’s left defenseless doesn’t help. The only means of survival comes from running and hiding until whoever or whatever is chasing you gives up. Games like Five Nights at Freddy’s had you stationary in a security booth watching cameras for the animatronic monsters that were coming to kill you. In Emily Wants to Play Too, developer SKH Apps LLC has you not only running from your fears but facing them as well. 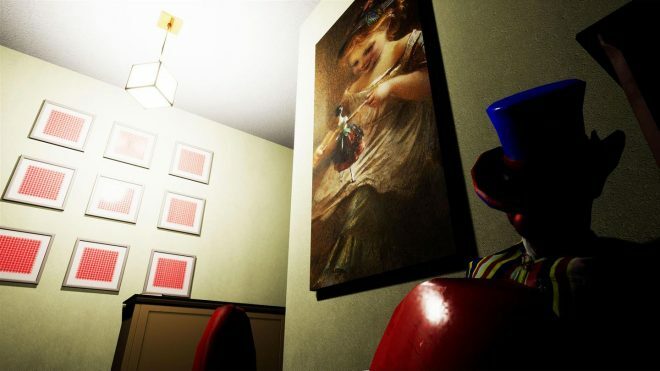 Emily Wants to Play Too is a direct sequel to the original game. In the sequel we find ourselves playing as a man who works at for a local sub shop as a delivery driver. While delivering an order to a local office, our protagonist quickly finds himself locked in and forced to play various games against Emily and her 6 doll friends. Kiki the Porcelain doll with the black dress, Mr. Tatters the clown and Chester the ventriloquist dummy all reprise their roles from the original game sporting new abilities. New to the roster are 3 additional dolls including a mannequin that hates light, a jack-in-the-box equipped with a legit weasel that will pop out and chase you, as well as a burned baby doll that continually cries for mama and will give chase whenever you are close. Various Tasks – The original Emily Wants to Play had the character trapped in the house with Emily and the three dolls. Most the tasks had you surviving each night against one or more of the dolls. One unique wave had you searching for Emily while trying to avoid the dolls. The concept was unique, but the game really started to feel tedious quickly. Emily Wants to Play Too addresses that by adding more unique objectives each hour. Granted, Survival against certain dolls is still the main task of certain hours, but other times you’ll find yourself playing hide and seek, an interesting take on musical chairs, and even freeze tag. Clocks Everywhere – If you’ve played the original, you would know that 1 hour game time translated to about 6 minutes of time in reality. Sometimes you’d constantly wonder how far through an hour you were due to the tasks at hand feeling relentless. Emily Wants to Play Too puts all the previous issues with time to bed by including clocks all around the office area. Hours that pertain to survival are still strictly about 6 minutes in length, but the hands on the clock move to give you a better idea of how much longer you need to survive. The idea is somewhat of a double-edged sword. Yes, it’s great knowing how much time you have left until an hour has passed, but can leave you on edge constantly. Whiteboards – Think of whiteboards as the objective screen. If at any time during play you are confused what you should be doing, consulting the nearest whiteboard may give you the answer. Written by the dolls themselves, some whiteboards tell you exactly what you should be doing while others are meant to throw you off to do the exact opposite of what you should be doing. It’s interesting for it to push you in the right direction and throw you through loops at the same time to keep you involved. 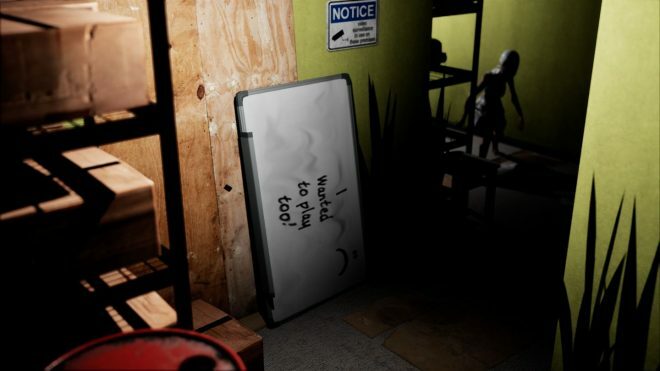 There are even a few whiteboards with messages from Emily or the dolls themselves pertaining to their thoughts or feelings which is surely just present for comedic value. Changing Objectives – Chances are you will fail the objective at hand and will be forced to start the hour over again. When this happens, depending on what the objective is, you may need to look elsewhere than you did previously. Tasks such as finding your car keys, locating a keycard and even finding specific characters during hide and seek all change if the objective is failed, and you’re forced to reload the checkpoint. It’s something that you don’t see a lot of games do. The idea of moving the key items around really adds more uniqueness to the game as opposed to knowing exactly where to go and avoiding everything to get there. It can also help for anyone wanting to play the game a second time as it makes for a different replay. Doll Spawns – The biggest issue with the original Emily Wants to Play came from the spawns of the dolls. The biggest issue being that the clown and the ventriloquist dummy spawned together multiple times in the same room. The issue was that the clown required you not to move, and the dummy required you to transition to another room. Being unable to do either would result in an unfair death. In the sequel, this problem goes unaddressed for these two characters, and with the additions of other dolls, the issue becomes more problematic. For example, Kiki requires you to stare at her until she disappears, this leaves you completely vulnerable from behind where potential other dolls can spawn and grab you. Turning away from Kiki to focus on the other enemy will result in Kiki grabbing you. The whole system is random where it spawns enemies, who it spawns and when they spawn so it’s really hit and miss and luck based. No Brightness Option – It’s quite obvious the reason a brightness option doesn’t exist is that the developers wanted to keep the game scary. Though with the addition of the option to turn off jump scares already included, would allowing us to turn up the brightness, even just a little be that big of a deal? Not everyone has the convenience of playing in a dark room. For those required to play with blinds open and light shining in will find it quite a hindrance on their play through trying to see. Granted, the protagonist does get a flashlight. The problem is the flashlight is very low light compared to what it should be in certain areas. Emily Wants to Play Too is a definite improvement over its predecessor. 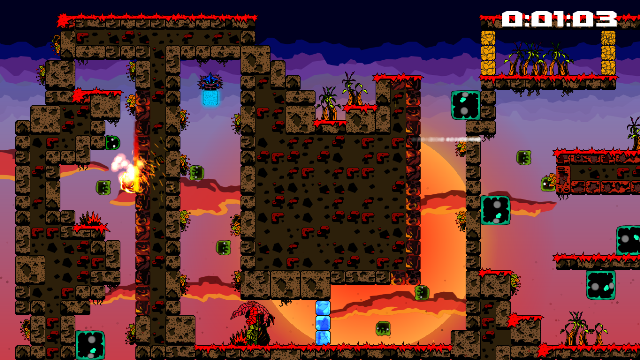 The game follows the same flow as the first game while introducing new characters and ideas to help the game feel fresh. The new office location is terrifying enough to keep the player on edge, and the size is just big enough to help the game to feel larger than the original. The game can be completed in just a few hours depending on how quick you are to complete each hours objective and even offers a timer for those wishing to challenge themselves to how fast they can finish. If you’re looking for a game that will help kill a few hours of your time and possibly even your nerves, Emily Wants to Play Too is exactly what you’re looking for! Emily Wants to Play Too was developed and published by SKH Apps LLC. The game released on April 25, 2018, for $7.99. A copy was provided for review purposes.